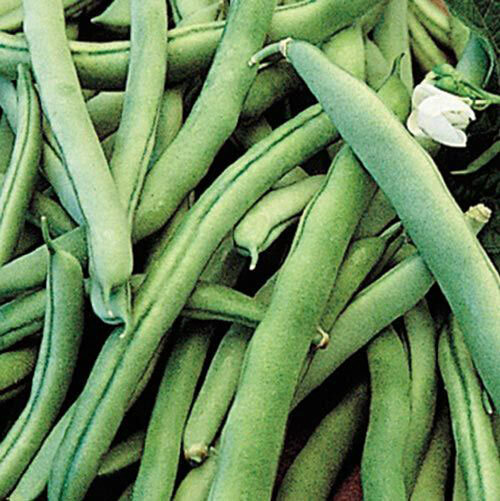 Blue Lake 274 Bush Beans | Gurney's Seed & Nursery Co.
Firm texture and rich color of "the good old days." Seeds develop slowly, so the 6- to 6 1/2-in.pods stay smooth. Matures its large crop early and all at once. 58 DAYS. FormAnnual. Upright, no staking required. SpacingSow 1 inch apart, thin plants to 2 - 3 inches apart, 24 - 36 inches between rows. FruitDark green pods with white seeds, stringless. Soil RequirementsRich, well-drained soil; pH 6.0-6.8. Seed Count2 oz. packet is approximately 150 seeds, 1/2 lb. is approximately 600 seeds and 2 lbs. is approximately 2400 seeds. CommentsThe favored canning bean. Disease resistant to BCMV. Disease tolerant to NY15. Low in fiber. Slow seed development. Produces heavy crops over a long season. Yield120 lbs. per 100 foot row. Botanical NamePhaseolus vulgaris 'Blue Lake 274'; Family: Fabaceae/Leguminosae (Bean Family). Size6 to 6 1/2 inch pod length.